HOW BIZ STAIN FIGHTER CAN MAKE YOUR HOLIDAYS GREAT! First of all, I would like to start off with letting you know that for the last year I have served as a brand ambassador for BIZ Stain Fighter. And honestly, it has been the most eye opening experience for me. I have learned so much about laundry and how to fight stains on laundry that now I never have any problems with them anymore. It has been a great honor to be a brand ambassador for BIZ Stain Fighter. It has also been an honor to bring you valuable information that can help you, the customer navigate the world of so many laundry detergents, stain fighters, etc. For you to choose BIZ means a great deal to the company. It is now that time of year when we all gather with loved ones and friends and think of all the wonderful things we have shared throughout the year: memories, friends, family, children, laughter, sorrow and how that will get us through the next year together. But it can also be stressful preparing to host a gathering like this. So much preparation goes into it. Did you know that BIZ Stain Fighter can help ease some of this stress? There are several things that you can use it for in the house that will help prepare for the guests. Let me list them for you! Cleanse any remaining stains and freshen holiday linens. Because BIZ Stain Fighter uses four different types of stain removers, it can help remove old stains as well as freshen linens up for their use during the holidays. Red wine? Uh oh. Gravy? Oh no. Turkey juice? Ugh. All can be removed with the help of peroxides, enzymes, whitening agents and detergents, the arsenal of BIZ Stain Fighter. You can use the powder form and soak the linen in a mix of the powder and water solution for a few hours and then when you are ready to go, pour on some of the liquid solution and wait a few minutes before starting the laundry. While the laundry is running try to use one of the liquid boosters in the laundry, as they are concentrated and will really freshen up the laundry, brighten the colors, whiten the whites, etc. Try to do a patch test first if possible. Bathtub, Toilet & Tile Cleaning: Are your tubs, toilets and tile looking a little worse for wear? They can when you have a full family using them all the time. And it's hard to get in there and clean sometimes. Use BIZ Stain Fighter to help clean and deodorize tubs, showers, soap scum, tile & grout, floors, sinks, toilets and more. Sprinkle BIZ on a wet sponge, cloth or brush. Scrub on the surface to clean (I would wear gloves if I were you). Don't allow to dry. Rinse thoroughly. For tile & grout, wet the surface, make a paste with water and BIZ. Apply to the area to be cleaned and let sit for 10 minutes. Scrub with a sponge or brush to clean the surface. Don't allow to dry. Rinse thoroughly. For toilets, add one scoop to the bowl, mix with a brush to dissolve the powder and clean the bowl. Let it stand for 15 minutes, then flush to rinse thoroughly. In The Kitchen: Use in a couple of places in the kitchen. It can be used to clean and deodorize counter tops, waste cans, refrigerators, floors and more. First, mix 1 scoop (1 cup) of BIZ in 1 gallon of warm water. Apply solution to dirty surfaces with sponge, cloth, or mop (again, I suggest to wear gloves). Or, it can be sprinkled on wet sponges, cloths or brushes. Also, you can scrub on the actual surface to clean it. Again, don't let it dry. Rinse thoroughly. BIZ can be used to freshen up the garbage disposal, pour 3/8 cup (lowest line on scoop) of Biz into the disposal. Let stand for 15 minutes. Then flush with hot water while running the disposal. General Cleaning Rules: These should be followed when using BIZ on any surface. Always test in an inconspicuous area before use. Rinse surfaces thoroughly (hard surfaces can be slippery if not rinsed completely because there is a residue). Do not mix with other chemicals – only mix with water. Some stains or tasks may take a stronger solution than noted or additional applications. Some warnings about mixed solutions: Do not seal container the container it is in, as it may expand, rupture, or leak. Only ese mixtures within 6 hours for best performance, the contents break down after that and are not as effective. Note, BIZ Stain Fighter is not recommended on: water sensitive items such as leather, silk, wool, fabrics that are labeled dry clean only, painted or finished wood, unpainted wicker, jute, teak or metal. For metal: do not soak any metals or jewelry in the solution. I hope that these suggestions help you decrease some of the stress that the holidays bring upon all of us who are hosting guests, family members and friends. 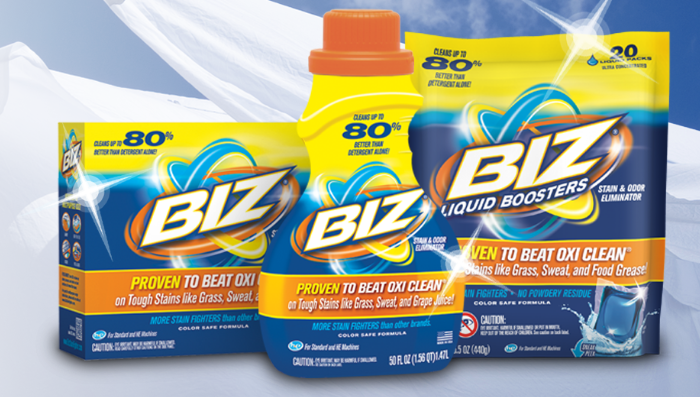 If you are having a holiday party, get together or dinner, just remember: you can make it a lot easier on yourself with many products that are out there to help you, such as BIZ Stain Fighter.